This BRIEFing NOTE reproduces the executive summary of Starting strong: Early childhood education and care (2001), the comparative report of early childhood education and care carried out by the Organisation for Economic Co-operation and Development (OECD) over the past three years. The OECD provides the following rationale for its work on ECEC: "The provision of care and education for young children is a necessary condition for ensuring the equal access of women to the labour market. In addition, early development is seen as the foundation of lifelong learning. When sustained by effective fiscal, social and employment measures in support of parents and communities, early childhood programming can help to provide a fair start in life for all children and contribute to social integration". The Starting strong report can be ordered from your nearest OECD centre or o online at www.oecd.org/bookshop (OECD Code: 912001011E1; ISBN 92-64-19282-4). 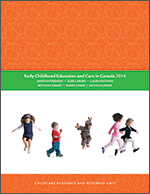 Early Childhood Education and Care OECD Thematic Review home page.